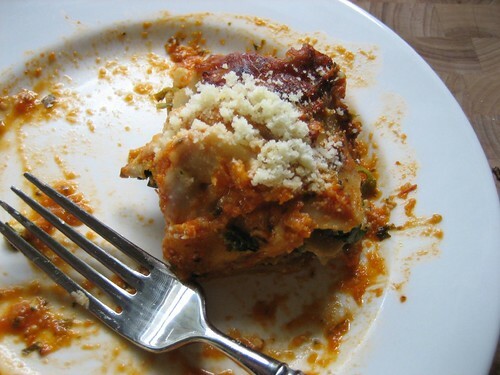 This is one of the easiest and best lasagnas I’ve ever made. Cook some lasagna noodles (just shy of al dente), rinse them and lay them out on the counter to cool. Saute some portobellos in a little olive oil – S&P to taste. The amount of mushrooms depends on how many you’re feeding. I made 8 rolls and used about 12oz of mushrooms (and I had a little left over). Brown the mushrooms (takes about 5 minutes), and add 1 1/2 cups of marinara. Lucky me, I used some of B’s Sunday sauce. That part’s done. In another bowl, combine a 15 oz container of part skim ricotta with 12 oz of thawed, frozen spinach and an egg – S&P, plus a little nutmeg to taste. I put about a cup of marinara in the bottom of the casserole dish. Spread about 2 tablespoons of the ricotta mixture on the noodle. Next, spread some of the mushroom mixture on top of the first layer. Then, roll them up and put them in the dish. Get them all in the pan and pour about 2 cups of marinara on top. Make a nice layer of mozzarella and Parmesan on top and loosely cover with foil and bake at 375 for 45 minutes. Uncover and cook for another 15 minutes to brown. I was hungry and didn’t want to wait, so I turned on the broiler. Next, I will turn then entire surface brown because the broiled cheese is so yummy.